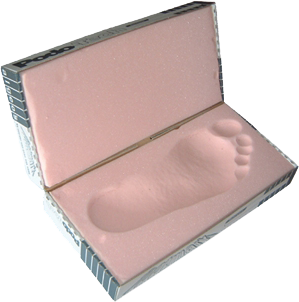 Used in large quantities throughout the Orthotic industry, these Phenolic foam boxes (casting boxes) are a quick and easy to use tool to take impression of the patients foot. Foam is fine and soft to prevent skin irritation. Patient places foot on foam and presses down, in a neutral or weight bearing position as required. Negative mould is then filled with Plaster of Paris for positive cast and rectified to suit.